Citation Information: J Clin Invest. 2019;129(2):744-758. https://doi.org/10.1172/JCI123524. Goblet cell metaplasia, a disabling hallmark of chronic lung disease, lacks curative treatments at present. To identify novel therapeutic targets for goblet cell metaplasia, we studied the transcriptional response profile of IL-13–exposed primary human airway epithelia in vitro and asthmatic airway epithelia in vivo. A perturbation-response profile connectivity approach identified geldanamycin, an inhibitor of heat shock protein 90 (HSP90) as a candidate therapeutic target. Our experiments confirmed that geldanamycin and other HSP90 inhibitors prevented IL-13–induced goblet cell metaplasia in vitro and in vivo. Geldanamycin also reverted established goblet cell metaplasia. Geldanamycin did not induce goblet cell death, nor did it solely block mucin synthesis or IL-13 receptor–proximal signaling. Geldanamycin affected the transcriptome of airway cells when exposed to IL-13, but not when exposed to vehicle. We hypothesized that the mechanism of action probably involves TGF-β, ERBB, or EHF, which would predict that geldanamycin would also revert IL-17–induced goblet cell metaplasia, a prediction confirmed by our experiments. Our findings suggest that persistent airway goblet cell metaplasia requires HSP90 activity and that HSP90 inhibitors will revert goblet cell metaplasia, despite active upstream inflammatory signaling. Moreover, HSP90 inhibitors may be a therapeutic option for airway diseases with goblet cell metaplasia of unknown mechanism. 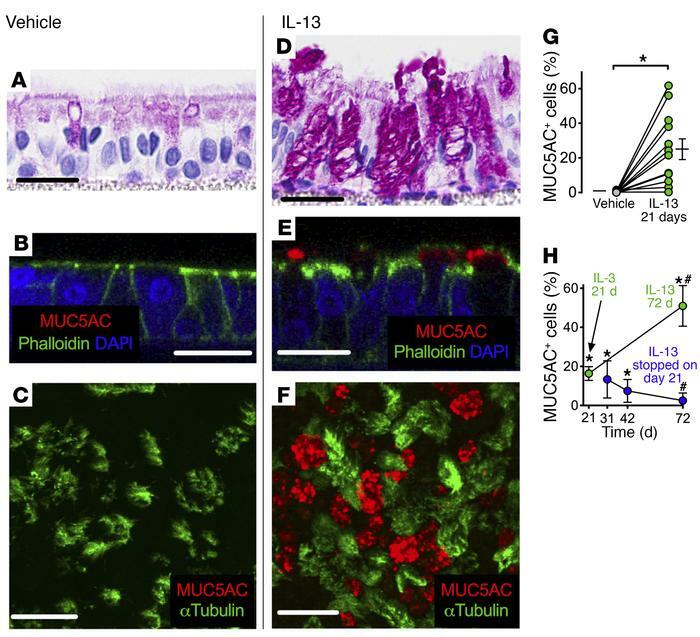 IL-13 induces goblet cell metaplasia in primary cultures of human airway epithelia. Primary human airway epithelia grown at the air-liquid interface were exposed to vehicle (A–C) or 20 ng/ml human recombinant IL-13 (D–F) for 21 days. dPAS staining (A and D) was performed to quantify goblet cells and other cell types. Immunofluorescence (B and E show orthogonal reconstruction, C and F show en face stack) was performed to quantify goblet (MUC5AC-positive) and ciliated (acetylated α-tubulin–positive) cells. Intracellular localization of MUC5AC was confirmed with phalloidin staining. (G) Percentage of MUC5AC-positive cells after 21 days of exposure to IL-13; each point corresponds to epithelia from a different donor (n = 12 biological replicates). (H) To determine the persistence of goblet cells, IL-13 exposure was terminated after 21 days, and goblet cells were quantified 10, 21, and 50 days after IL-13 treatment (experimental days 31, 42, and 71, respectively). Scale bars: 20 μm. n = 6 biological replicates. Pooled data are shown as the mean ± SEM. *P < 0.01 versus the corresponding vehicle-treated group; #P < 0.05 versus 21-day IL-13 treatment group; 2-tailed, paired t test.